The thing about Vogons reading you poetry is that it was their poetry*. I think the damage is less severe if I present you someone else's poetry. Again from the archives is a bit of student rhyme from the 1990 school year, when I was just starting out. 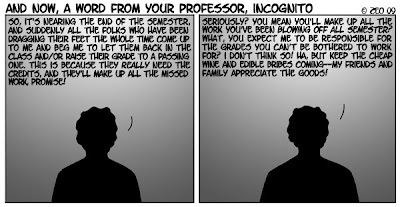 This is in honor of the end of the semester, which comes a bit early for us due to a misguided alteration of our schedule to "compressed" mode. The non-lab divisions love the extra two weeks each semester, but all lab sciences had our labs cut, to the detriment of science education. It was all supposed to give us a full summer schedule with complete course offerings, but the enrollments and state budget cuts made that impossible. If we could only have been there! And their importance to us! On Pangea I or II? Could I get a map to go there? If so I bid you adieu! Digging through the old archives of two decades of teaching, I found the other "field note" from my very first field trip. I was leading students along a stretch of the San Andreas fault where it passes through Cajon Pass in southern California. Along the way we passed the Indian Hill fault, the Cucamonga fault, the San Jacinto fault, and finally the San Andreas. Looking at the 25 year-old comic, I was reminded once again that many people in our fair state don't really know the dynamics of the land they live on. The professor: "All earthquakes in California happen on the San Andreas fault. True or false?" The class: "Uh, (suspicious pause) false?" The professor: "Very good! Name another fault in California." Teachers of earth science have a daunting task: educating a public that is ignorant of the very real geologic hazards that surround them, in a time when a typical google search list is topped by Britney Spears and Obama's choice of dog. One thing has certainly changed in two decades: television has made a difference. Cable channels like Discovery and National Geographic have in fact tapped into the very real curiousity people have about the world and geologic hazards that exist there. My students seem better informed about earthquakes and volcanoes and other topics than they used to be. It's a good thing, but there is a problem. But they also know more about sharks from "Shark Week" than they know about ocean ecosystems and the threat of over-fishing and ocean pollution. In other words, they know the flashy stuff, but their understanding of the underlying principles is still lacking. A television show cannot communicate that kind of deeper understanding. That's part of what we must do as teachers: adding the protein and vitamins to the empty calories of mass media presentations. Want to learn more about teaching earth sciences? Check out the National Association of Geoscience Teachers (also here, and here) or the National Earth Science Teachers Association. Having gone into the old archives, having been reminded of how long I've been doing this, I offer another snippet of student art; this was from the very first class I taught, period. I was working as a laboratory assistant at my alma mater with a newly minted BA in Geology (this was 1981), and I hadn't really decided what I was going to do next. Another nearby college, which did not have a dedicated science department or majors, still needed to teach some basic science courses, and they wanted to know if anyone at my school wanted to moonlight for a semester. None of the professors was available, but the school twisted some regulations to allow me to be the teacher of an Introduction to Geology course. I had 8 or 9 thoroughly disinterested students in a night class that I thought lasted from 7 to 9. I was nervous. I begged my professor to let me copy his lecture notes and I did so thoroughly, practically memorizing them word for word. I held on to those notes like a security blanket during my lectures, hoping and praying the students wouldn't ask any questions. But somehow that first night I made it to 9:00 o'clock and told the students they could go. They looked at each other quizzically and got up and left. This went on for weeks. The last week of class, I looked at the grade sheet, and saw that the class was scheduled from 7:00 to 10:00! And not one student ever said anything about it! I learned a lot about teaching that semester, but the most important thing I learned is that I could actually teach. Maybe not the most brilliant academic mind, but I could communicate the interest and excitement about the earth that I myself had. 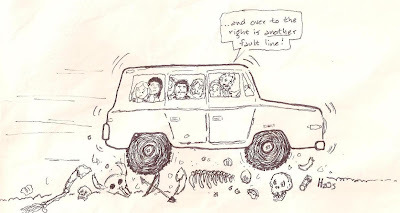 And I especially liked field tripping. 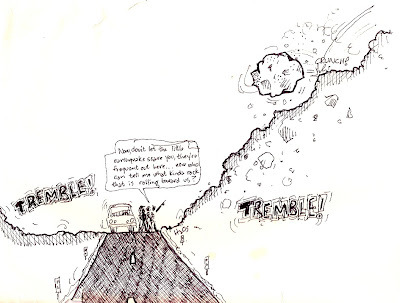 The comic above was one of the two pieces of paper a student turned in at the end of the field trip along the San Andreas fault at Cajon Pass in southern California. No notes, just a pair of comics. Modesto often makes the top of the lists of the worst towns in the United States to live in, for reasons that are not always clear to me...I've seen a lot of places on my travels that I wouldn't wish on anyone. One of those books complained that the best thing about Modesto that anyone can say is how close it is to other, more wonderful places like the Sierra Nevada, Yosemite, the Mother Lode, the Coast Ranges, and the Bay Area. I've always considered that an advantage. Imagine living in a place that you can visit the snow, but not worry about shoveling it off your driveway. Imagine living in a place where you can visit a temperate rainforest, but if it is raining, you can drive home to clear skies. Sure, we get the tule fogs, and it is hot, dry and dusty in summer, but altogether Modesto is not a bad place to live. We are building a long-needed Community Science Center that will house the biology, physics, chemistry, astronomy and geology departments as well as a nice museum, a planetarium and an observatory. We are near the end of the architectural planning and the subject of office choices came up, and the idea of seniority was floated about. With the retirement of our astronomy professor this semester after 35 years of teaching, that senior person...was me. OMG. I am finishing my 20th year of teaching at the college. TWENTY years! I don't know how that much time passed so quickly. I was the young kid in the department when I started, surrounded by veterans of 25 or 35 years or more. One by one they've retired, and new people arrived. I was once the one with the young kids at department functions, but now the young kids belong to others. My kids are pursuing their careers and degrees. 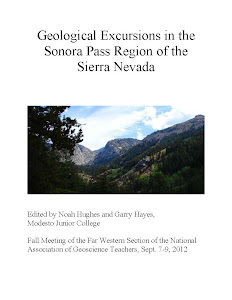 As you may have seen from my biography, I am the past-president of the Far West Section of the National Association of Geoscience Teachers (NAGT). The section includes California, Nevada and Hawaii. 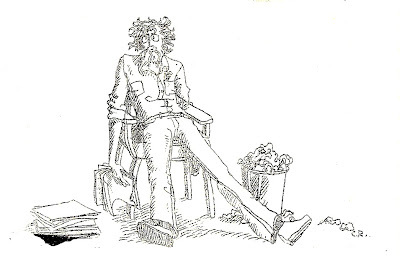 When they put you out to pasture, it turns out you still get to do things...I am now the webmaster (for better or worse), and someone thought the section should have a blog for rapid dissemination of announcements and deadlines and that sort of thing. So I get to do that too! It debuts today, as the Teaching the Earth Sciences blog. I only have a few posts up so far, but it should be growing in time. You'll be able to check on award and scholarship deadlines, academic openings, publications, and conference announcements, as well as anything we find of interest to teachers of the earth sciences. I would be grateful for ideas and polite critiques! NAGT is a great organization, especially the Far West Section. They have one or two conferences each year somewhere in the three-state region, and the conferences including field trips and teaching seminars, and attending these events has been some of the geologic highlights of my life. I've been able to tour Death Valley, the Mojave Desert, Anza Borrego, Hawaiian Volcanoes, the Klamath Mountains, Mount Shasta, the eastern Sierra Nevada and the Long Valley Caldera, the Black Mountains near Lake Mead, Sequoia, Yosemite, the Mother Lode, the Marin Headlands, Cambria and Big Sur, and Lake Tahoe. I've been in gold mines, tourmaline mines, caves, coal pits, and I've found all manner of minerals, fossils and rocks that have enriched my teaching career. All of these tours include geologic guidebooks, which are for sale to anyone, and they are a great resource (check out the publications list here). They also provide scholarship support for students in our region, and recognize an Outstanding Earth Science Teacher of the Year as part of a national program. The national NAGT also has many resources available on the web for teachers, and there are nine more sections around the United States and Canada in addition to our Far West Section. Check it out, if you are a teacher now or are thinking of becoming one. Membership is open to anyone with an interest in the earth sciences. While acknowledging that many geobloggers currently work (or recently worked) in the mining industry (Silver Fox, are you reading? ), many of the rest of you may not have a true sense of the scale of effort that goes into the mining of the materials that our civilization must have. 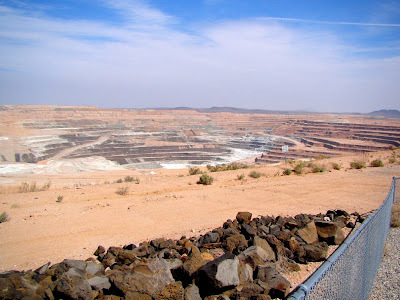 Last month I paid a visit to the Rio Tinto U.S. Borax mine in the Mojave Desert between the towns of Mojave and Barstow on Highway 58. 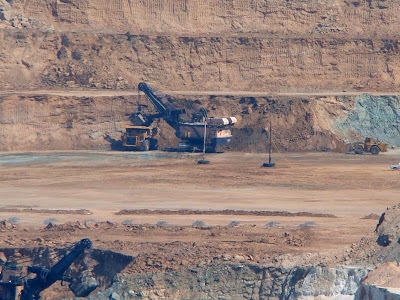 It is a great place to learn about the scale of mining (and play with the zoom function on a new camera! ), and to appreciate that the sheer effort involved. I'm not shilling for the company exactly; it's more that I appreciate the effort they have put into visitor education and especially want to note the excellent visitor center they built, perched right on the edge of the big pit. Borate minerals never quite had the glamour of gold and silver mining, but they certainly had a colorful history in the Death Valley/Mojave Desert region. First discovered in Death Valley in the late 1800's, the minerals were transported by the iconic 20-mule teams (remember the powdered soap?) to the railroad at Barstow. The discovery of borate minerals in the Calico Mountains a short distance from Barstow caused the shutdown of the DV mines, but Calico played out a few years later. A farmer seeking irrigation water discovered a briny solution of borates at the site of the present-day mine, and mining began in the late 1920's. About half of the borate minerals mined in the entire world come from the pit at Boron. And it is a big hole, about 1 1/2 miles long, and hundreds of feet deep. The first picture is the view of the pit from the roof of the visitor center. The second is a 15x zoom to a point just to the right of the center of the first picture where the giant shovels and loaders can be seen hard at work (you miners can correct the nomenclature in the comments!). They are big. There is a small pickup truck parked in front of the shovels that can't really be seen in the thumbnails (click on the pictures to enlarge). 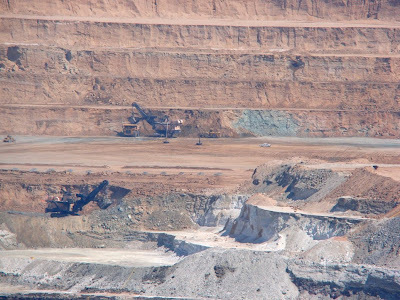 The third pic is a 30x zoom that shows better the scale of the big machines (the pickup is on the right edge of the photo). In the last picture, Geotripper himself demonstrates the size of the tires on the loaders (photo courtesy of Susan). No one ever explains how they fix flats. The visitor center is a nice facility, and if you have a class headed to Death Valley or the Eastern Sierra Nevada, you might consider paying them a visit (map and directions here). It of course extols the value of what they do, but it also has some beautiful specimens of the important minerals, like colemanite, kernite, and ulexite (the fibrous tv stone). They also usually have a nice pile of the ore minerals outside that can be collected. And they have a modest gift shop with a mineral t-shirt, and a nicely illustrated periodic table. And toys and books! The National Park Service now estimates that the March 28 Ahwiyah Point Rockfall had a volume of 43,000 cubic meters, or 115,000 tons. This means that the event was almost 50 percent larger than the 1996 Happy Isles Fall (30,000 cubic meters), and is the largest event since the 1987 Middle Brothers slide (1.5 million tons). The airblast was reminiscent of the Happy Isles event. These pictures, taken by Greg Stock, the park geologist, show the views I wish I had when I was there last weekend. The top photo is from the switchbacks to Snow Creek, and the other is obviously from the edge of the destruction zone. 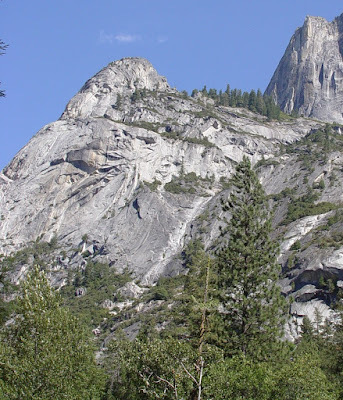 For some strange reason, rock climbers have been inordinately interested in this event, and the effect it may have had on some of the Half Dome climbing routes. Via Geology.com, here is a comment string replete with photos from a number of climbers. Tragedy this week in L'Aquila, Italy, when a 6.3 magnitude quake collapsed buildings and killed 235 people (at last report). Many in the geoblogosphere have commented about the tectonics of the quake (check here for the latest posts), and the seemingly odd juxtaposition of extensional quakes in an ostensibly compressional landscape associated with convergent boundaries. I don't have much to add to the discussion, but I did want to share a few photos of another town in the Appennines in central Italy where the quake occurred. Gubbio is small medieval village tucked along the mountain flanks of the fault systems that slice northwest across the region. The valley is a prominent fault graben and provides a vivid example of the appearance of the many fault zones in the region. In Roman times, the inhabitants of the region felt secure enough to live out on the valley plain, under the protection of the Roman Empire. When the empire crumbled, the cities became isolated and vulnerable to attack, so they moved the towns to a more defensible position at the base of the steep mountains. Walls and buildings were robustly constructed out of thick walls of mortar and rock. Unfortunately, little thought was given to the possibility of earthquakes, and many of the buildings (as we saw this week) are seismic death traps. When a valley sinks along a fault system, a mountain block rises in a relative sense, forming a prominent ridge. 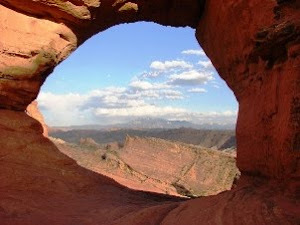 Erosion produces deep gorges, and the original fault surface (the scarp) is shaped into a series of triangular facets , separated by wineglass canyons: alluvial fan (base of glass), deep mouth of gorge (the stem of the glass), and the open canyon above (the cup). These features are visible in the photos above. 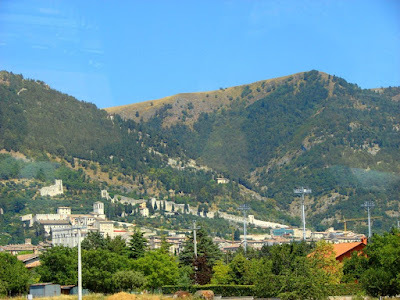 Unfortunately, Gubbio is threatened by the same kind of earthquake activity. The top photo shows the triangular facet that forms the backdrop of Gubbio, while the second reveals part of the wineglass canyon formed by the erosion of the Bottaccioni Gorge. The pictures are a record of one of the great geologic days of my life: a visit to the Gubbio exposure of the clay layer where the Alvarez team made the discovery of the iridium anomaly that led to a new interpretation of the extinction of the dinosaurs and much of the other life on the planet at the K/T boundary. Unfortunately, I was trapped on a bus that was not under my control, and we didn't have time to stop for better composed pictures. 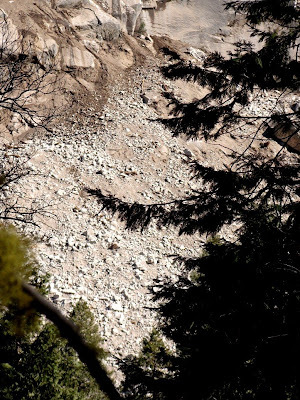 When the Ahwiyah Point Rockfall impacted after a tumble of 1,800 feet, the slabs and boulders of granitic rock exploded, producing an airblast that is reported to have flattened hundreds of trees (and also producing a magnitude 2.4 earthquake). It also pulverized the rock. Completely. As I walked on the north side of the Mirror Lake Loop Trail, I didn't see anything right away, but then I nearly slipped and fell on a granite boulder that would normally provide fine traction. I looked and realized the boulders around me were covered with a fine powder up to a quarter inch thick. It looked like volcanic ash, and it occurred to me and my students that the dust would actually be chemically indistinguishable from rhyolite tuff (granite and rhyolite are coarse- and fine-grained varieties of silica-rich igneous rock). It really didn't even feel gritty, and it got all over our shoes and pants. We were on the far outer periphery of the impact zone, so only a few weakened tree trunks were knocked over. Several are shown in the second photo. That's all I have on the slide for now. I hope to be able to get closer to the impact zone on my next trip in the area. 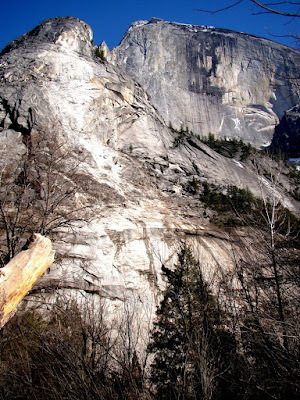 The Ahwiyah Point rockfall in Yosemite Valley was probably the largest rockfall since 1996, when the Happy Isles fall killed one person and severely damaged the Nature Center (photo here). Luckily the slide a week ago occurred early in the morning so no one was on the trails covered by the event. 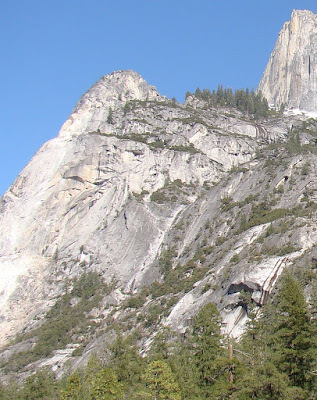 Access is a bit tricky, but good views of the entire pathway of the slide can be had from the trail north and east of Mirror Lake (the south side of the loop is covered with rockfall debris). Unfortunately (for us geologists) views of the impact area are not so easy; I didn't have time to bushwack across the river, and it was probably still very dangerous in the impact zone anyway. 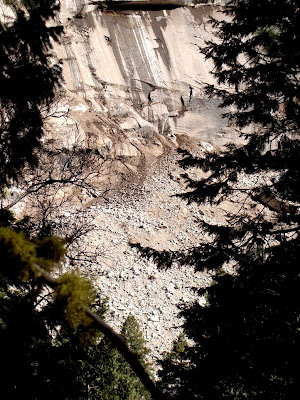 The first photo shows the entire rockfall zone, from near the top of Ahwiwah Point to the base of the canyon slope on Tenaya Creek. The high rock on the right side is Half Dome, from an angle not often seen by casual tourists (it requires a one and a half mile hike, after all!). The total length of the fall was 1,800 feet. The second is a zoom on the release point (sorry for the intervening branches; I took about 30 pictures and zoomed only the one time! There were clearer views elsewhere). The nearby trees provide scale; the rock mass was dozens of yards across. The third and fourth photos provide the only view I could get of the impact zone. Lots of new talus slopes up there, lots of mangled logs, and if you look very carefully at the top of the talus pile, you can see a single tree that survived the onslaught of falling rock. One more set of photos in the next post! 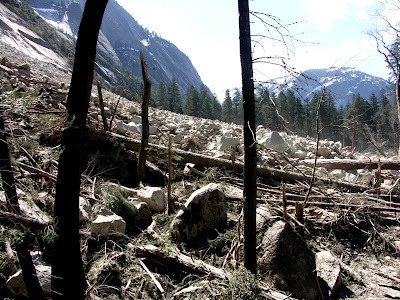 For a first look at the latest rock fall in Yosemite National Park, I offer two nearly identical perspectives of Ahwiyah Point: I didn't predict the rock fall! I was able to crop a shot of Half Dome from a trip in 2004 that included Ahwiyah Point and almost match it from a shot taken today. The release point is on the left side, near the top of the cliff. 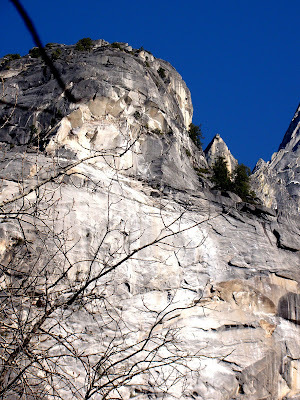 The scar of the rock fall is visible from many, many points in the valley, including perhaps the most famous at the Wawona Tunnel. 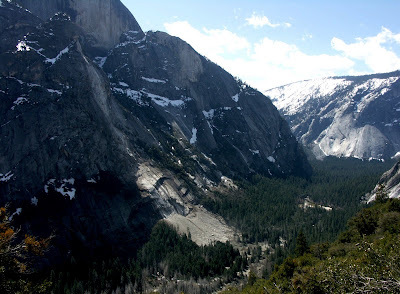 The appearance of Yosemite Valley is changed forever, even if in a relatively small way (small from a distance, anyway; it is greatly changed from up close)! Details are starting to emerge about the event, including seismic information. 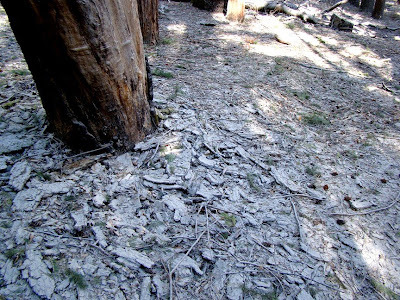 The rock mass fell some 1,800 feet, and more or less exploded on impact, causing an airblast that spread pulverized granite dust throughout the area. 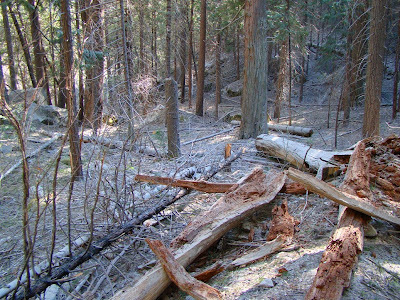 The rocks and blast knocked down hundreds of trees, according to a preliminary note from the park geologist, Greg Stock (from the park's daily report at http://www.nps.gov/yose/parknews/upload/daily.PDF). Thankfully, no one was injured. I had the privilege today of taking 25 students to Yosemite National Park on a geology field studies trip; despite living in Modesto, only 2 hours away, some of them had never seen Yosemite Valley before in their lives. The valley did not disappoint (it rarely does): sunny, middle fifties, scattered snow patches, wonderful spring wildflowers in the foothills (very little in the valley), and a bear. I'm tired tonight, so I leave you with a view from the newly renovated Tunnel View Parking Lot below Inspiration Point. 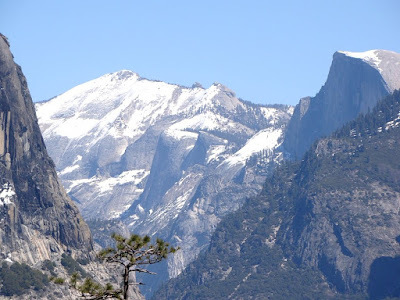 The snow covered peak on the left side is Cloud's Rest, the highest point visible from the valley floor at just over 9,900 feet, and of course the iconic Half Dome on the right. The unobtrusive outcrop in the lower center part of the photo was the site of a significant rock fall a week ago, and we made a reconnaissance trip to the vicinity of the impact. Pictures to follow in the next post!